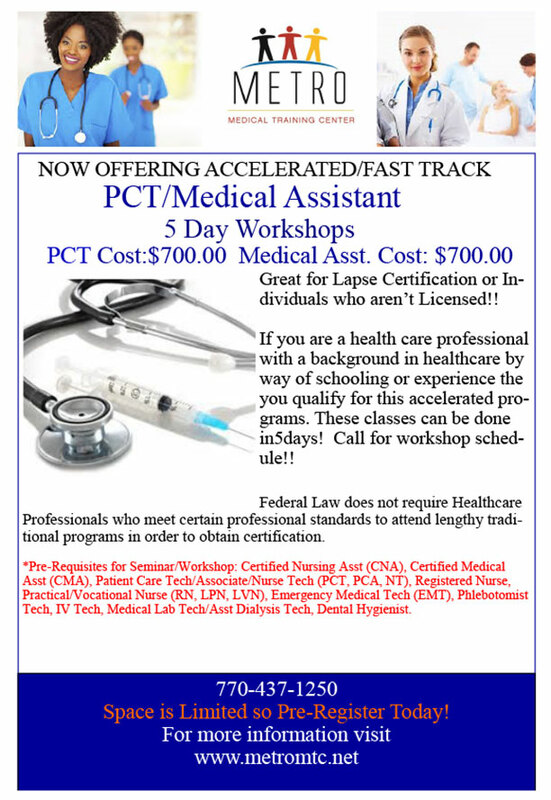 Great for lapsed certification or individuals that aren’t yet licensed! If you are a health care professional with a background in healthcare by way of schooling or experience then you qualify for this Accelerated Workshop. * Pre-Requisites for Seminar/Workshop: Certified Nursing Asst (CNA), Certified Medical Asst (CMA), Patient Care Tech/ Associate/Nurse Tech (PCT, PCA, NT), Registered Nurse, Practical/Vocational Nurse (RN, LPN, LVN) Emergency Medical Tech (EMT), Phlebotomist Tech, IV Tech, Medical Lab Tech/Asst Dialysis Tech, Dental Hygienist! Federal Law does not require Healthcare Professionals that meet certain professional standards to attend lengthy traditional programs in order to obtain certification. REFUND POLICY: The student must cancel within three days of registration in order to receive a full refund minus a $100.00 processing fee. Student must cancel in writing or by fax with in the three-day cancellation period for the refund to be valid. If student does not cancel with-in the three day period she/he forfeits all monies. There will be no exceptions. Refund will be issued within 45 days after cancellation. If you register 2 days or less prior to a seminar the refund policy will not apply. In the event that a student is dismissed from seminar (for any reason) NO REFUND IS DUE. By registering for these seminars you have read and acknowledge full understanding of the refund policy.